Following the arrival of the Saxons and now the Vikings, Wales is one of the last redoubts of native Britons in A Total War Saga: Thrones of Britannia. A new trailer from devs Creative Assembly gives us a look at their leader, Anaraut, and the burden he carries. 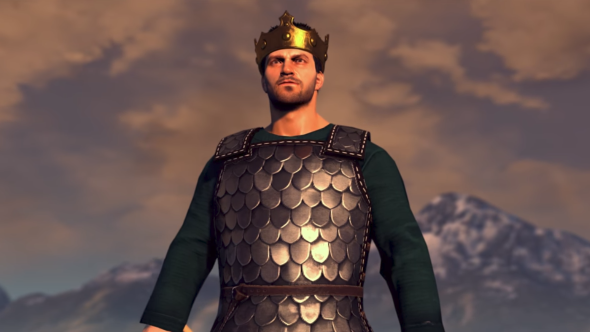 For more on Thrones of Britannia, check out our gameplay preview. King Anaraut succeeds his respected father, Rhodri, as leader of Gwined – one of the two Welsh factions in the game. Building on Rhodri’s legacy, his task is to consolidate the nation of Cymri – similarly to the other faction leaders, and reflecting the titular theme of Thrones of Britannia. A new blog post on the Total War website goes into more detail as to how you’ll do this, in that it explains the mechanics of the Fame victory condition. Where the standard Conquest victory is about painting the map, Fame is about developing your faction. You’ll do this through certain buildings, technologies, or by building the reputation of your king. Both Welsh factions – Gwined and Strat Clut – get the advantage of the unique Bard building chain to help build their fame. Thrones of Britannia is out on April 19. More information is on the Steam page.